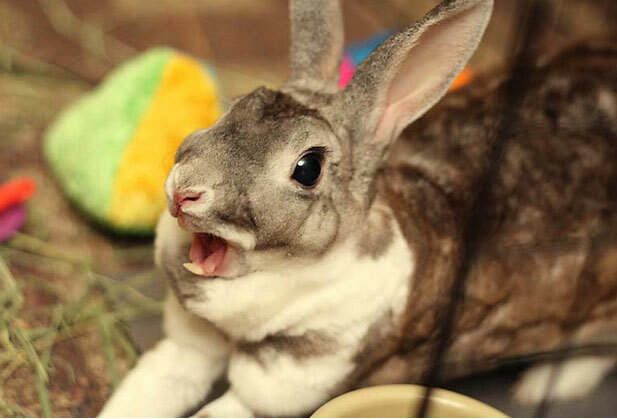 If a rabbit appears unable to eat, first look at its mouth to see if the incisor teeth are overgrown, giving rise to the condition known as dental malocclusion or 'buck teeth'. Your veterinarian will cut the teeth back for you, although it is possible to carry out this task yourself. First obtain a pair of bone clippers -scissors are not really suitable- and ask someone to hold the rabbit for you on a table or similar level surface. Then pry open the mouth and, holding the jaws, clip the teeth. Do not be tempted to cut the teeth too short; simply remove the twisted area of growth. Offering chewing blocks, or even dried crusts of bread, may help to slow down growth of the incisors, but within a few weeks you will almost certainly need to clip the teeth again. Dribbling of saliva from the mouth, known as 'slobbers', may also be caused by a dental problem. The most noticeable sign is likely to be an area of wet fur at the comer of the mouth, with possible swelling around the side of the face if a tooth abscess is the cause of the complaint. A closer veterinary examination will be essential for this problem, and the rabbit may have to be anesthetized. Using modem drugs, this is a relatively safe procedure, as it is for guinea pigs. While the effects of drugs are well studied in rabbits, much work is still required to discover why these animals appear so susceptible to diarrhea. The problem is usually complex, involving more than one infectious agent. Yet it does appear that stress of any kind is significant, and that young animals are most at risk. The signs of mucoid enteritis will typically be seen in rabbits up to about five months of age, with a peak likely around the two to three month period. Affected animals lose their appetites and grow listless. Diarrhea, often clear and jelly-like, rapidly becomes apparent, together with an accompanying high level of water consumption. An accumulation of gas in the abdomen may give rise to the characteristic swelling described as bloat, and death will occur within about a week of the symptoms first appearing. Where large numbers of rabbits are at risk, the use of medicated foods may be advisable through this crucial period. Once the disease does occur, however, the likelihood of recovery is relatively slight; and even if they do survive, affected individuals may remain stunted. Part of the difficulty with treatment is that there appears to be no single cause of mucoid enteritis. Bacteria, including members of the costridial group, are known to be involved in most cases. In addition, Bacillus piliformis, which is responsible for Tyzzer's Disease, can be identified in cases of mucoid enteritis. Tyzzer's Disease is recognized as a separate ailment affecting even younger rabbits, normally about six weeks old. It invariably proves fatal at this stage, with symptoms similar to mucoid enteritis. If rabbits do die from enteritis of any kind, thoroughly clean and disinfect their quarters to minimize the risk of spreading the disease. Also dispose of their bedding, preferably by burning it. When faced with a sudden, explosive outbreak of this problem, consult a veterinarian without delay. It will be possible to carry out post-mortems, and from the results of these plus other tests, notably those to find the bacteria concerned, it may be feasible to treat surviving stock. LegacyCages.com offers a wire mesh indoor rabbit cage and high quality guinea pig cages for your pets.